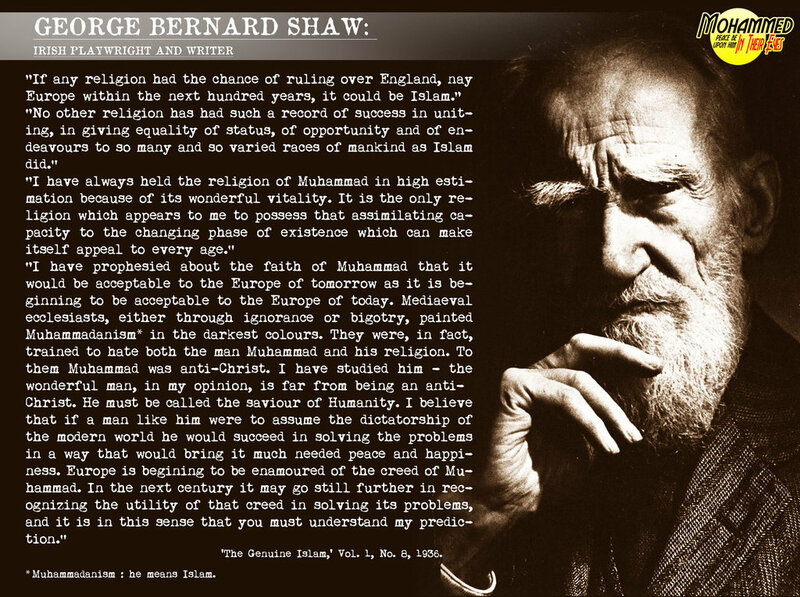 What did Sir George Bernard Shaw, say about Muhammed and Islam? ” I have always held the religion of Mohammed in high estimation because of its wonderful vitality. It is the only religion which appears to me to possess that assimilating capability to the changing phase of existence which can make itself appeal to every age. The world must doubtless attach high value to the predictions of great men like me. I have prophesied about the faith of Mohammed that it would be acceptable to the Europe of tomorrow as it is beginning to be acceptable to the Europe of today. The medieval ecclesiastics, either through ignorance or bigotry, painted Mohammedanism in the darkest colors. They were in fact trained both to hate the man Mohammed and his religion. To them Mohammed was Anti-Christ. I have studied him — the wonderful man, and in my opinion far from being an Anti-Christ he must be called the Savior of Humanity. I believe that if a man like him were to assume the dictatorship of the modern world he would succeed in solving its problems in a way that would bring it the much-needed peace and happiness. But to proceed, it was in the 19th century that honest thinkers like Carlyle, Goethe and Gibbon perceived intrinsic worth in the religion of Mohammed, and thus there were some change for the better in the European attitude towards Islam. But the Europe of the present century is far advanced. It is beginning to be enamored of the creed of Mohammed. I believe that if today an autocrat of Mohammed’s caliber assumes world leadership, he could solve all problems of humanity splendidly. The world will become an abode of peace and happiness. Allah or *G-D – 2,069 times. (Despite what many Muslims believe Allah is not The Name of The Creator. It is more like The Title, of The Creator. A Title that means: The One True Creator of the Heavens and Earth. In numerous verses in the Holy Qur’an, Allah tells us that HE has the Most Beautiful Names. HE encourages Humanity to pray and call on HIM by any of those Names. Prophet Muhammed name is mentioned less times for a very specific reason. Many non Muslims who have never studied Al-Islam or the Holy Qur’an erroneously believe that Muhammed wrote the Qur’an. Muhammed just like the majority of Arabs at that time; could neither read nor write. The Qur’an describes him as, “an unlettered prophet, sent to an unlettered people”. If indeed Muhammed did write the Qur’an; then he would certainly have put his name in it more than 4 times. Surely more times than any other Prophet. The Merciful Creator knew that over the centuries, some people would erroneously claim, that Muhammed was the author of the Qur’an. So quite possibly, that may have been the reason was Muhammed’s name is rarely mentioned in the verses of the Qur’an. Also in many places in the Qur’an, Muhammed is reprimanded by Allah, for errors and mistakes in judgement, that Muhammed made. Muhammed had said and done things that was not approved of by G-D.
Why would a person write a book that reveals his embarrassing errors and mistakes? If Muhammed had written the Quran, none of his mistakes would have been included. Any intelligent person among the Christians, and Jews who truly believes in the Lord-Creator of the Heavens and Earth; should want to read this Revelation from G-D for themselves. Also those who sincerely believe in Atheism, Buddhism etc. should also study the Holy Qur’an. They should not just parrot the negative things that they have heard the media or others who hate Islam and Muslims; say or write about the Holy Qur’an. The hidden secret circles (rings), who have been controlling the hearts and minds of the people of Europe and the Americas for centuries; don’t want their dupes to study the Qur’an for themselves. They have been promoting a negative concepts about Al-Islam, Muslims and the Qur’an. They know that their dupes would wake up, if they seriously studied the Qur’an and Islam. Their ‘sheep’ would wake up overnight, if they studied the Qur’an. The sheep herders, also know that if the people they control and manipulate started to study the Qur’an; they would see for themselves that the majority of Muslims are not really following the Qur’an. They would see that many Muslim’s daily behaviour, does not represent the religion they claim to follow. There is a quote that I heard many year ago, that was attributed to Sir George Bernard Shaw. The majority of Muslims worldwide are so far away from the real message of Al-Islam, it is like night and day. “.. If we can recognize these realities, this change, and heal ourselves, and embrace the good, and embrace the progress, and embrace the good aims and good purposes for which this nation was envisioned or created by its Founding Fathers, and how the spirit and language that they left with us has gained support,..
Then we are in a good situation to make progress in this society. Who was Sir George Bernard Shaw? George Bernard Shaw (26 July 1856 – 2 November 1950) was an Irish playwright and a co-founder of the London School of Economics. Although his first profitable writing was music and literary criticism, in which capacity he wrote many highly articulate pieces of journalism, his main talent was for drama, and he wrote more than 60 plays. He was also an essayist, novelist and short story writer. Nearly all his writings address prevailing social problems with a vein of comedy which makes their stark themes more palatable. Issues which engaged Shaw’s attention included education, marriage, religion, government, health care, and class privilege. He was most angered by what he perceived as the exploitation of the working class. He became an accomplished orator in the furtherance of its causes, which included gaining equal rights for men and women, alleviating abuses of the working class, rescinding private ownership of productive land, and promoting healthy lifestyles. For a short time he was active in local politics, serving on the St Pancras Vestry. Shaw was noted for expressing his views in uncompromising language, whether on vegetarianism (branding his own pre-vegetarian self a “cannibal“), the development of the human race (his own brand of eugenics was driven by encouragement of miscegenation and marrying across class lines), or on political questions (in spite of his own generally liberal views he was not an uncritical supporter of democracy, and is even recorded as supporting, or at least condoning, the dictators of the 1930s). In 1898, Shaw married Charlotte Payne-Townshend, a fellow Fabian, whom he survived. They settled in Ayot St Lawrence in a house now called Shaw’s Corner. Shaw died there, aged 94, from chronic problems exacerbated by injuries he incurred by falling from a ladder. He is the only person to have been awarded both a Nobel Prize in Literature (1925) and an Academy Award (1938), for his contributions to literature and for his work on the film Pygmalion (an adaptation of his play of the same name), respectively. *G-D instead of god. Because god spelt backwards is dog. This is not a respectful spelling of a word to be used for The Lord-Creator of the Heavens and Earth. ** The Qur’an was revealed to Muhammed Ibn (the son of) Abdullah in the 7th century. He received this revelation over a 23 years time period from the Angel Gabriel. Muhammed was just like the majority of Arabs at that time, he could neither read nor write. The Revelation was given to him by the Angel Gabriel and implanted in his memory. Muhammed, then recited it to his fellow Arabs. The majority of his followers, who heard the recitation of the Qur’anic verses, from Muhammed; in turn memorised what they had heard. After Muhammed death his son-in-law Uthman; who was the third leader of the growing Muslim community, after Muhammed’s passing; had these memorised verses of the Qur’an compiled into a book form. He gathered a majority of those who had heard the recitation from the Prophet Muhammed and had memorised it, to testify to the authenticity of what had been compiled into the book. They all verified that it was exactly the same as they had heard the Prophet recite it. The Prophet is referred to in many verses in the Qur’an as being unlettered. An unlettered Prophet sent to an unlettered people. WHY ARE SO MANY YOUNG MUSLIMS TURNING TO TERRORISM? The picture below, is of the House called the Khaaba in Mecca, Arabia. This House, was built by Abraham and his son Isma’il centuries ago. This was the first Place built, as a house of worship and dedicated to The One True G-D of the Heavens and Earth. Abraham prayed, that all Human Beings who believed in ONE G-D; would make a pilgrimage to this House. Muslims, no matter where they are in the world; turns towards the Khaaba when they pray.